Moralo Eval, proud owner of the most transparently symbolic name since Miraj Scintel, has not previously appeared on The Clone Wars. His introduction in last week’s episode, “Deception,” immediately gives the viewer the feeling they’ve come into the adventure in the middle. This isn’t necessarily a bad thing: the opening scenes of A New Hope employ exactly the same in media res technique. 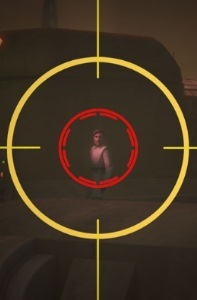 The new character also serves to expand the Star Wars universe; I’ve commented before about how the over-use of characters and locations makes the EU seem unrealistically small and interconnected. By starting out with an unknown factor, however, my viewing of the episode would have to gain an emotional hook. To my great amusement, it did. The trailer clip for “Deception” showed a funeral, and it takes the episode some time to get to that affecting scene. The introduction of the Big Three of the Clone Wars (Obi-Wan, Anakin, and Ahsoka) is good, with some dialogue clearly showing Anakin’s dislike of the Council and Obi-Wan’s more accepting manner. A lot can be conveyed in two lines if they’re two good lines. When the camera pans out, we get a great view of the city and an Attack of the Clones style assassin. It’s another fine example of how to keep the Star Wars feel and give the viewer new information – in this case, that the Jedi are in danger. The next line of dialogue isn’t so effective. Ahsoka’s remark “Would you rather they call you in to train younglings?” and Anakin’s sarcastic retort “Are you crazy?” do show that the Chosen One and his protégé have achieved a similar level of comfort and banter as the older two Jedi have. These lines would have worked better for me, though, if it had been clearer whether it’s Ahsoka self-deprecatingly referring to herself as a youngling (but her voice isn’t directed far enough in one way or another to be clear whether she’s being sarcastic), or simply drawing attention to her presence (“well, the Council did assign me to you, so that’s one thing they did right that you should be grateful for”), or actually referring to a specific past experience. The animators and choreographers deserve huge kudos for this episode, from the camera lingering on Anakin’s flapping coattails before he left it behind in a rapid Force leap to his flailing arms as he tried to bat away the smoke from a grenade. I loved the latter gesture particularly because it looked ineffective and therefore spoke of Anakin’s emotions: he knows he’s not going to wave off the smoke with his sleeves alone, but when you’re a hot-headed man who’s just heard your mentor get shot, you’re going to want to gesture. His anger carries the next scene as the Jedi react to Obi-Wan’s (false) death. I loved the furrows and shadows on his face that hint forward to his Episode III self as well as portraying the grief and age of a mourning man. Ahsoka’s wide-eyed, about-to-cry expression just after Obi-Wan’s death was also wonderful and subtle. More kudos to the writers for not adding any dialogue. That’s another great example of this episode’s storytelling being unusually efficient. Where we might have gotten a dramatic “he’s dead” to reinforce the moment, the script lets the viewer figure it out by visual cues. The man responsible is Brent Friedman, a writer and organizer of franchises whose credits include God of War and Command & Conquer. He has also been employed as a creative consultant by 343 Studios, current owner of Halo. Dear Dave Filoni, please give more work to this man. Love, Megan. On the other hand, the episode isn’t perfect, and I had some problems with the feasibility of the Jedi plot that enables the whole episode. The big question I had was why and how did all of the Jedi except the Council believe that Obi-Wan was dead? Both, though, are discussed briefly. The dialogue explains the why with the necessity of the ploy being realistic: the criminal underworld keeps tabs on the Jedi and could discover a subterfuge. Mace Windu notes that Anakin’s reaction “sold” the appearance of death. The how is harder. 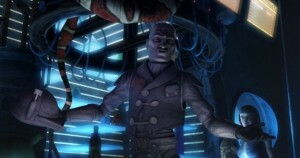 While The Clone Wars tends to undervalue the telepathic nature of the Force – perhaps to avoid having characters use non-verbal communication that could be confusing to the viewer, or to avoid Jedi solving problems too easily – Darth Plagueis has recently shown that a body’s midi-chlorians leave it at death, and an observant Jedi or Sith around the dying person can tell when the Force has gone out of them. Even without that recent bit of lore, could Obi-Wan really keep this deception out of his Master-Padawan bond without the Chosen One noticing? Mace does allude to that concern, so maybe it will be an issue in future episodes of this arc. There’s not a lot of interesting stuff happening with the female characters. Ahsoka is present at the start, but the prison where most of the action takes place is male-only. This is realistic, though, so it’s hard to complain. 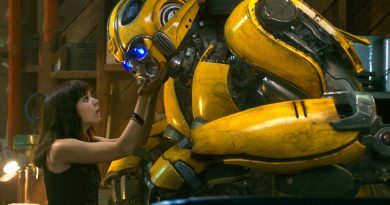 The other female character who gets a speaking role is a simpering humanoid at a bar who mutters, seemingly to herself, what may be either the funniest or the worst Star Wars pickup line in history: “I’d like to check his midi-chlorian count.” “Deception” isn’t passing the Bechdel Test any time soon, but Mr. Friedman’s quality writing allows this episode to just plain make a lot more sense than many of the others. Plans are explained, characters are shown having emotional reactions to things, and short scenes make the episode feel longer than half an hour instead of like a long story packed into too short a time. Obi-Wan undergoes what looks like a painful face-reconstruction surgery that also gives him the pale skin and tattoos of the sniper he’s supposed to emulate. I didn’t know they had that in the Star Wars universe. I wonder if this is used among the civilians, as well. The vocal emulator is a similarly unpleasant bit of technology. In the prison we get the return of a Karkodon, the shark-like species from the season opener. While I still think the name is silly, seeing one besides Riff Tamson solidifies their place in the galaxy. More importantly, hello Cad Bane! The Duros bounty hunter shows off his high fees and standards before Obi-Wan gets kicked out of the cell. Also appearing is Obi-Wan’s code name: Ben. Although I still want to know why he picked it, that’s wonderful to hear. This episode has the details I’ve been missing in The Clone Wars. Witness Obi-Wan running his hands over his scalp to feel his shaved head, or the way Moralo offers an alliance by advising the disguised Obi-Wan on how to make his prison food taste better. Moralo’s “Try the sauce” is never mentioned again, is never a plot point: it’s just a way to make it plain that Moralo wants an alliance without coming right out and saying it. It also adds that one, inessential, homey fact: Star Wars prisons provide sauce. Next on the list of “oh look, it’s that guy” appearances are Boba Fett and Bossk. Boba, voiced again by Daniel Logan, has a military haircut and a vendetta. He’s angry at the supposed sniper for stealing the bounty on Obi-Wan, and of course the viewer who’s been following the saga also knows that the sniper would have stolen Boba’s revenge against the Jedi for the death of his father. Bossk will later become Boba’s rival, a fact established before the prequels were released. Briefly, though, he’s the Mandalorian’s ally. He’s Obi-Wan’s too, as he sets off the prison riot that lets Obi-Wan, Moralo, and Cad Bane escape. The three previously established bounty hunters also aren’t just there to be references to their previous adventures. Associating Moralo Eval, a new character and unknown factor, with bad guys we love to hate gives him more clout and more narrative authority in the story. If Moralo can lead Cad Bane around, he must be one tough fellow. The escape also reminds us that Cad Bane is tough with or without a blaster, as well as his penchant for snapping at his teammates. Obi-Wan gets a nice moment of moral decision when he’s supposed to shoot a guard, but it doesn’t last long. Obi-Wan, unlike Anakin, doesn’t have to think hard about whether or not to take a life – Cad Bane does the killing for him. “Deception” was a dark episode, and while I do tend to like those, it isn’t a guarantee of quality. Dark themes tend to provide good atmosphere, though, and “Deception” has lots of it, from the bronze and yellow tones of Coruscant to the lines on Anakin’s face at the funeral and Obi-Wan’s defeated posture in the Council chamber. There are a surprising number of bodies, from a prisoner Obi-Wan shares a coffin with to the occasional clone guard. Mr. Friedman knows how to put obstacles in the hero’s way that provide fun adventure and move the plot forward instead of feeling like a substitute for it. I would like to see more Anakin and Ahsoka to disprove the theory that The Clone Wars’ cast is too large to give equal time to everybody if the episodes were all sequential. I have faith that Mr. Friedman and Dave Filoni could do it in this four-part arc, and faith in The Clone Wars has been hard to come by for me lately. If for every “Water War” and “A Friend In Need” we get a “Carnage of Krell” or “Deception,” I’d mark Season Four down as the best so far. I give “Deception” a 7/10. Megan Crouse is a recent college graduate with a strong interest in fandom studies and pop media. She writes This Blog Is Full of Words and has published poetry and short fiction. Other interests include martial arts, poultry, and Darth Maul.